EMSL Analytical, Inc. has a team of highly experienced laboratory professionals including microbiologists, chemists and materials testing experts that can analyze a wide variety of Food, Consumer Products, Cosmetics and Pharmaceutical Samples. Laboratory analytical methods used include: AOAC, FDA/BAM, USDA, USP, and ASTM. EMSL also has a dedicated Special Projects team that will work with you to customize methods to fit your project needs. 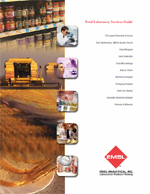 In addition, EMSL also offers Food Safety Consulting Services including: auditing services, FSMA readiness, GFSI /SQF consulting support, food safety program management, HACCP Plan development & certification, shelf life experimental design &result interpretation, challenge study design, execution &review, environmental monitoring programs, USDA & FDA compliance, labeling guidance and FDA import detention services.